Discover The 7 Habits of Highly Effective People by Stephen R.
For lasting change, you have to address your character, not just your behavior. When Stephen Covey embarked on his quest to truly understand the nature of success, he began by immersing himself in some 200 years worth of literature on the topic, starting from 1776. The first method is to work on the skills necessary for the behavior you desire. For instance, if you want to improve your relationships with others, you might study communication or body-language techniques. We can call this method the personality ethic. It’s been particularly popular since the 1920s, but, despite its sounding like a solid path for growth, it’s actually just a shortcut. The personality ethic lets you avoid working on the fundamental character traits that are holding you back, promising that some easily learnable technique will be the silver bullet for all your problems. Unfortunately, this promise is usually empty, and it almost never results in lasting personal growth. The second method is far more effective: working on your character – that is, the fundamental habits and belief systems that form your view of the world. Only behavior stemming straight from your character will endure over time, because, sooner or later, your true character will shine through. This can be called the character ethic, and it emphasizes things like courage, integrity and the golden rule. It was the dominant approach to success prior to the 1920s, clearly visible in the writings of stalwart individuals such as Benjamin Franklin. So if you really want to change, you need to work from the inside out. If, for example, you’d like to have a happy marriage, you need to first become a more positive person yourself, not just master a few easy techniques that’ll make others like you more. So how can you work on your character? Find out in the next blink. Align your way of seeing the world with basic universal principles. The first habit: Be proactive and take control of your own fate. The second habit: Begin with the end in mind. The second habit continued: Write a personal mission statement and integrate it into your daily life. The third habit: Put first things first. The fourth habit continued: forming stable relationships with others means investing in emotional bank accounts. The fifth habit: Seek first to understand, then to be understood. The sixth habit: Synergize by treating others with openness and respect. The seventh habit: Sharpen the saw if you want to keep sawing. 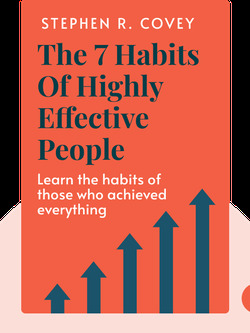 Start your free Blinkist trial to get unlimited access to key ideas from The 7 Habits of Highly Effective People and over 3,000 other nonfiction titles. With bitesize text and audio, it's easier than ever to find the right ideas to transform your life.